Also: those TJ brand sausages, labeled "made from soy" are actually made from soy and "egg white powder." It's funny to read reviews of these products from a non-vegetarian. I'm vegan and used to be vegetarian so I've had a lot of them. Hey Nick! I have, in my fridge, one of the Tofurky sausages. I won't say which one, but I'm having it for dinner tonight, so keep an eye out next Friday. Also, our local co-op carries a few Field Roast products, but we didn't pick any up this time. I haven't seen any Gardein products anywhere yet, but I'll keep looking. 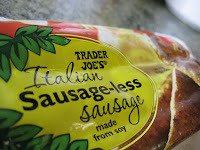 I just tried the TJ Sausageless Sausage the other day & loved it. I'm vegetarian, and have tried lots of fake meat products, and this one surprised me in a good way with its semi-spicy flavor & nice firm texture when browned. I had avoided it in the past because of the generally high fat content in other fake bratwurst/sausage products & brands; TJ's only has 7 grams of fat, which is not too bad. We've had this twice in the past few weeks. If you cut up the sausage and sautee it in a pan with olive oil and add peppers and mushrooms and then serve over orzo with lemon zest, olive oil and pepper it's a really nice meal.